Last month we posted about our adventure to Whidbey Island (Part 1 and Part 2). 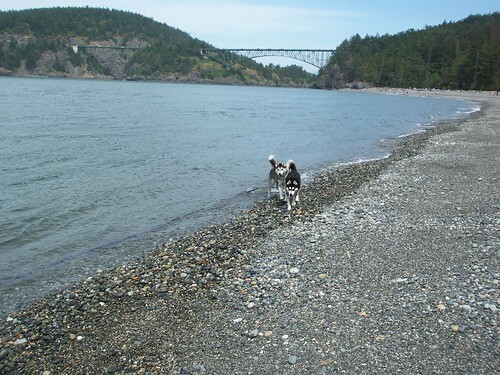 Over Memorial Day weekend, we went back and visited Deception Pass State Park again. We went on a longer hike and then went swimming. Here's a video of our swimming. We had some fun chasing rocks and trying to figure out those wave things. I also had a staring contest with a boat. Here's a picture with the cool bridge in the background. Notice how we didn't really pose for the picture Mom wanted. We are such good Siberians!